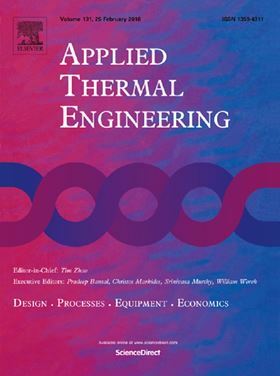 The research paper 'Thermodynamic analysis of a cascaded compression – Absorption heat pump and comparison with three classes of conventional heat pumps for the waste heat recovery' has been published in Elsevier journal Applied Thermal Engineering. In present study, a new heat pump named cascaded compression-absorption heat pump (CCAHP) is introduced, thermodynamically analyzed and compared with that three other classes of heat pumps (compression, absorption, and hybrid compression-absorption) with identical waste heat source. Ammonia-water solution is used in the absorption as well as hybrid systems and pure ammonia in the compression system. The simulations are performed in EES (Engineering Equation Solver) software. Low-grade heat is externally supplied to the systems and upgraded heat is transferred to a medium with high temperature. Comparison of the results shows that with increasing the temperature lifts, the PER (Primary energy ratio) and second law efficiency of the cascaded system reach to the values of these parameters of the compression system. Even at higher values of temperature lifts, that compression system cannot perform, cascaded system operates with higher values of PER and second law efficiency compared to those of hybrid compression-absorption system. Advantages of the proposed cascaded system are small value of compression ratio, maximum pressure and exit temperature of the compressor comparing to the other investigated cycles which extend the working domain of the cascaded system. A numerical study on the influence of cross sectional shape of floor splitter on the effectiveness of vorticity reduction in pump intake.